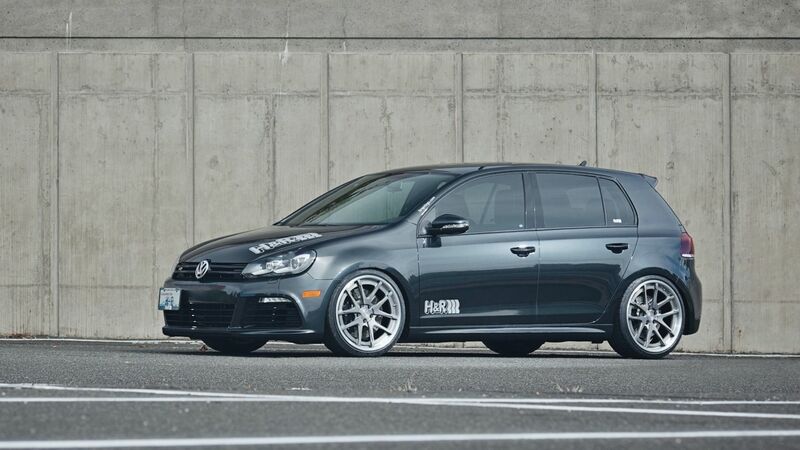 H&R 2013 Volkswagen Golf R | H&R Special Springs, LP. 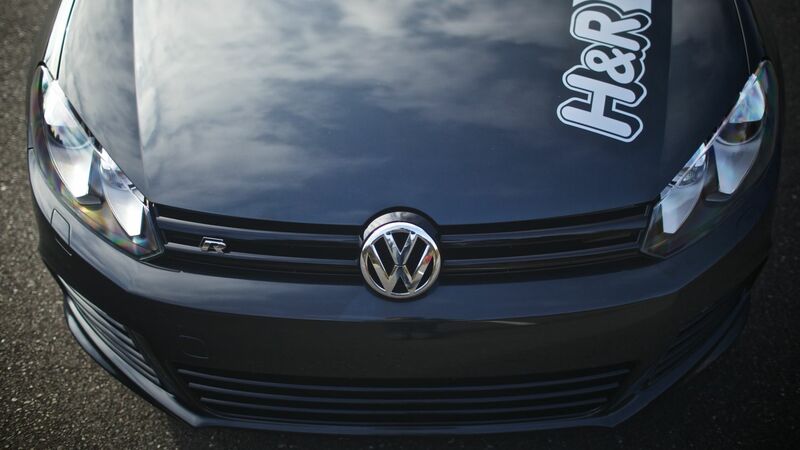 The wonderful project builders at H&R have once again started another great Volkswagen project! 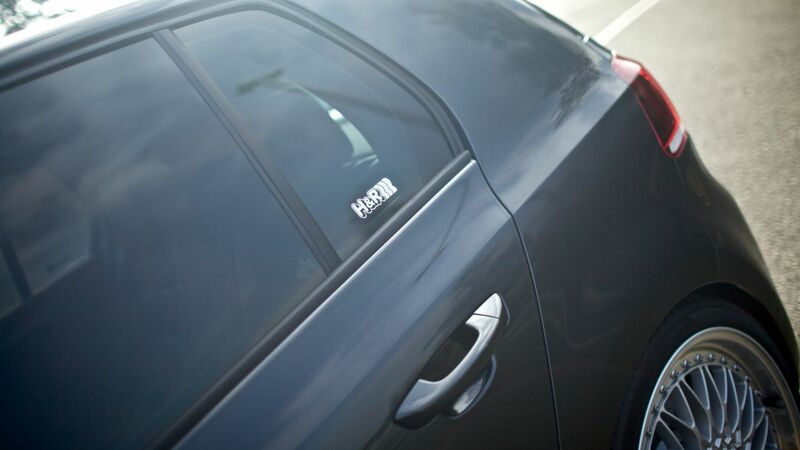 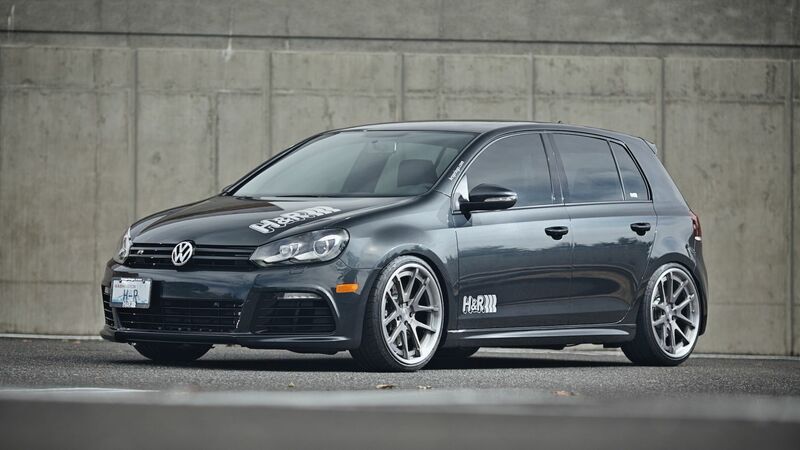 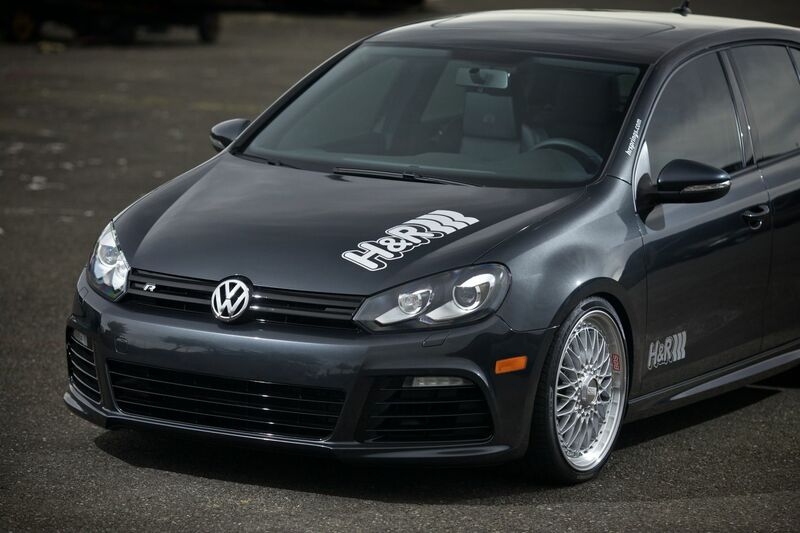 Follow along as the artisans at H&R work their magic on the awesome Golf R.
Starting with a 2013 carbon grey metallic Golf R, 4 door, H&R installed a Street Performance Tuner Coil Over suspension and the H&R 26mm rear Sport Sway Bar. 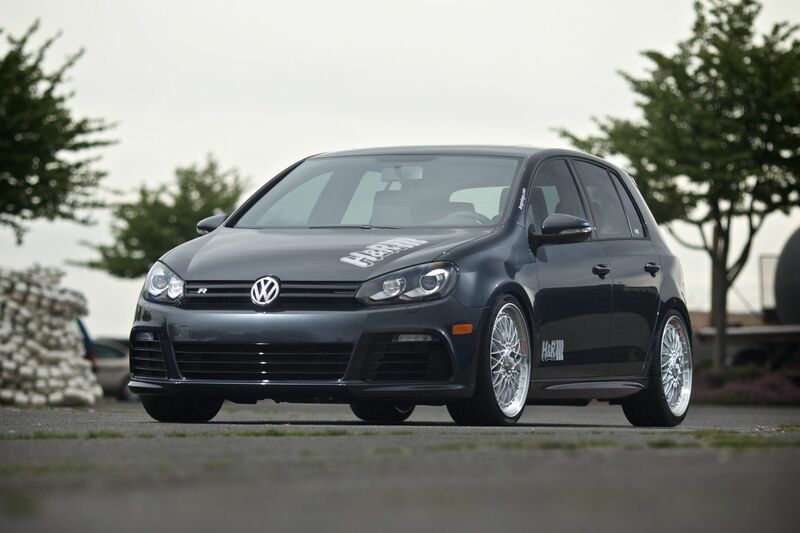 Tires and wheels are upgraded with BBS Super RS wheels in silver wrapped in Pirelli P Zero Silver tires. 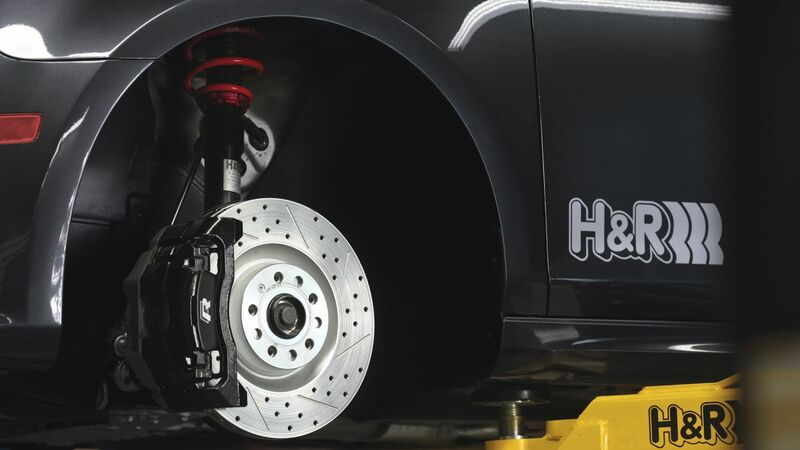 The special H&R Street Performance Tuner Coil Over with lightweight aluminum front struts and rear shocks keeps unsprung weight down providing precise suspension performance for this nimble chassis. 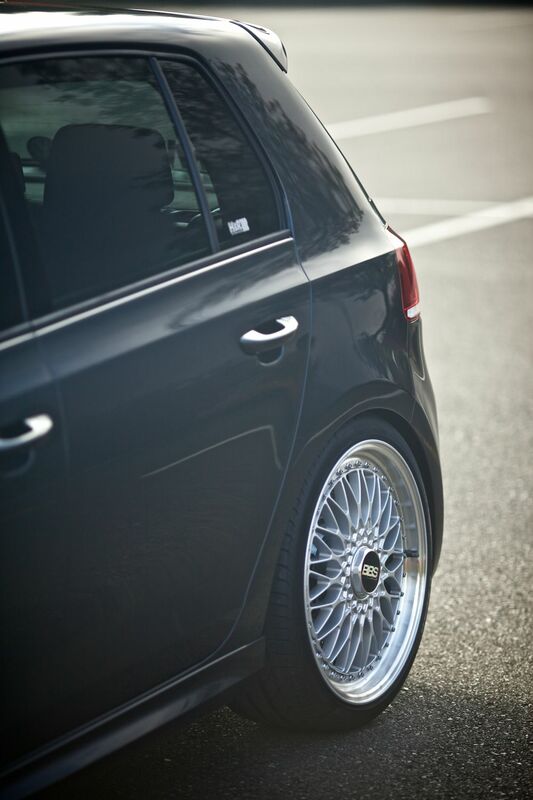 The H&R Coil Over’s are set at a lowering height of 1.25” front and 1.55” rear for the perfect European stance! 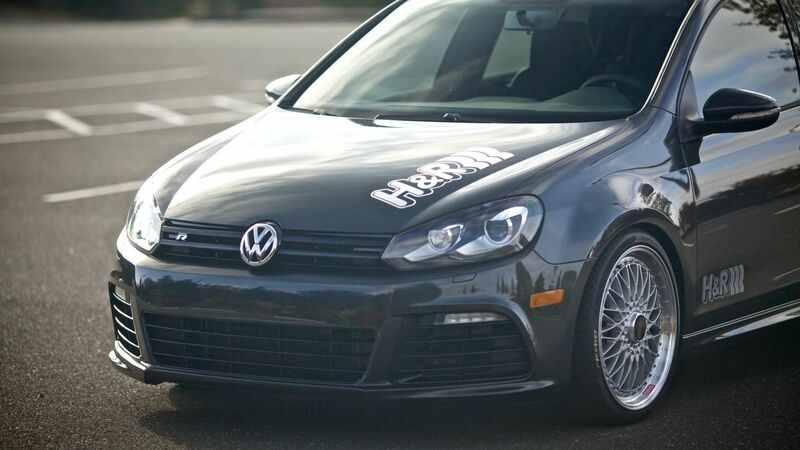 The addition of the H&R 26mm Sport Sway bar adds awesome turn-in. 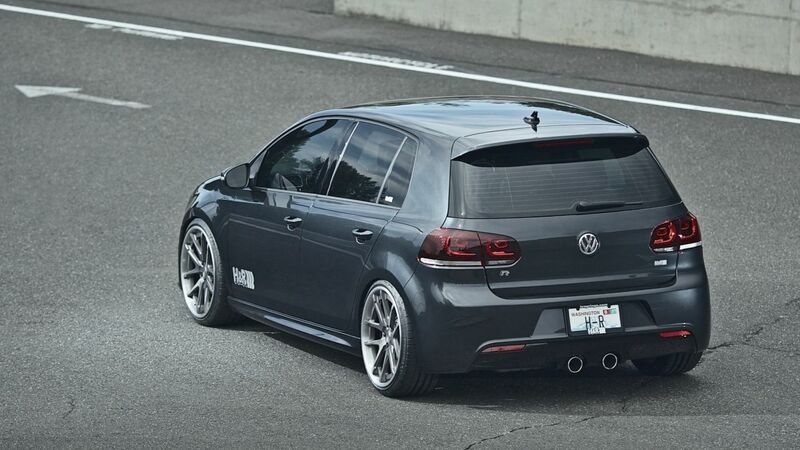 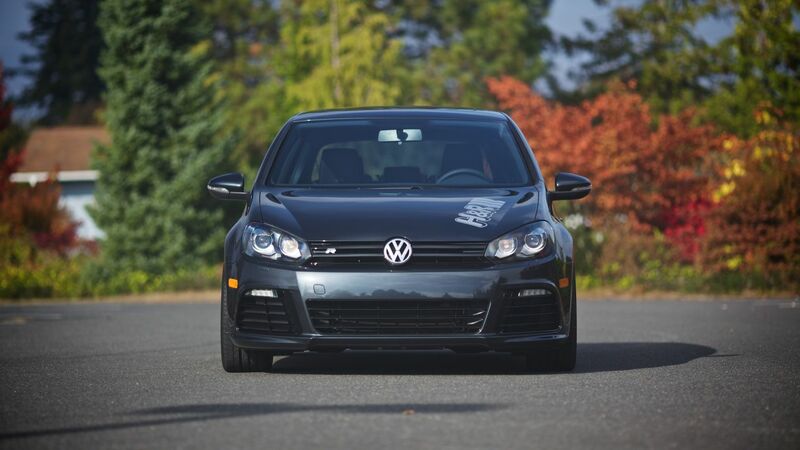 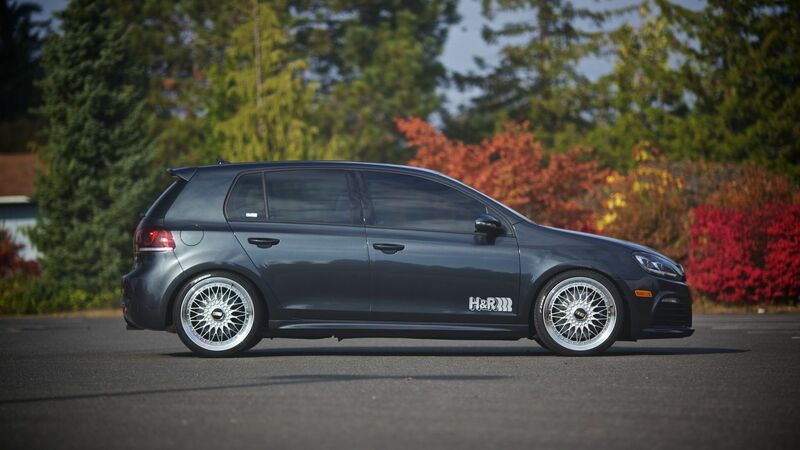 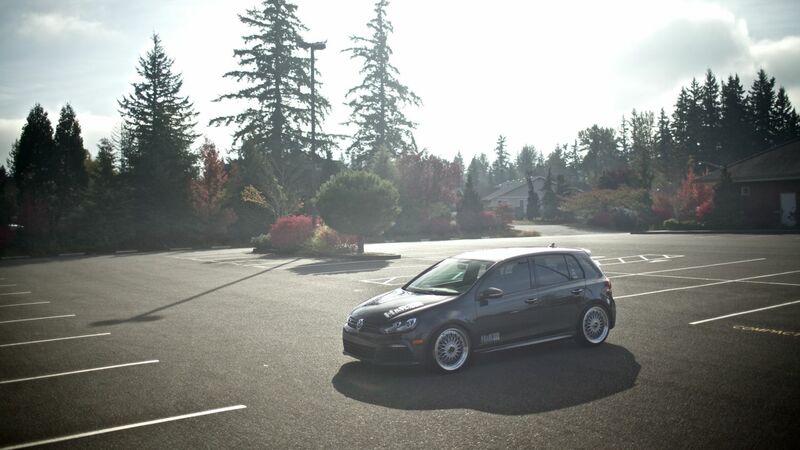 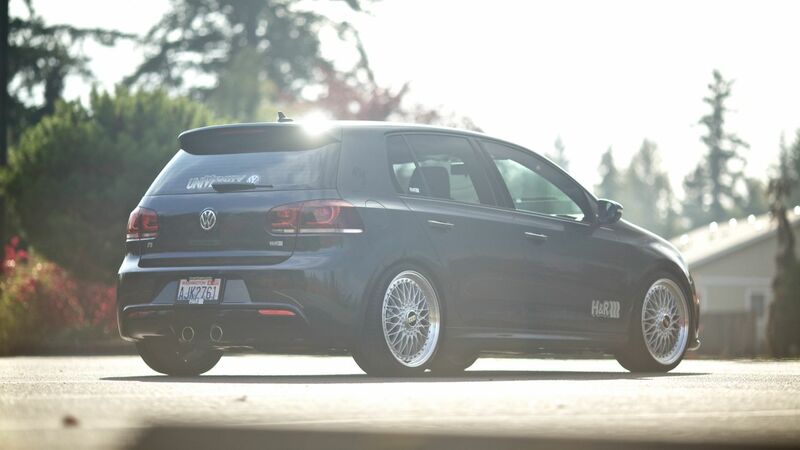 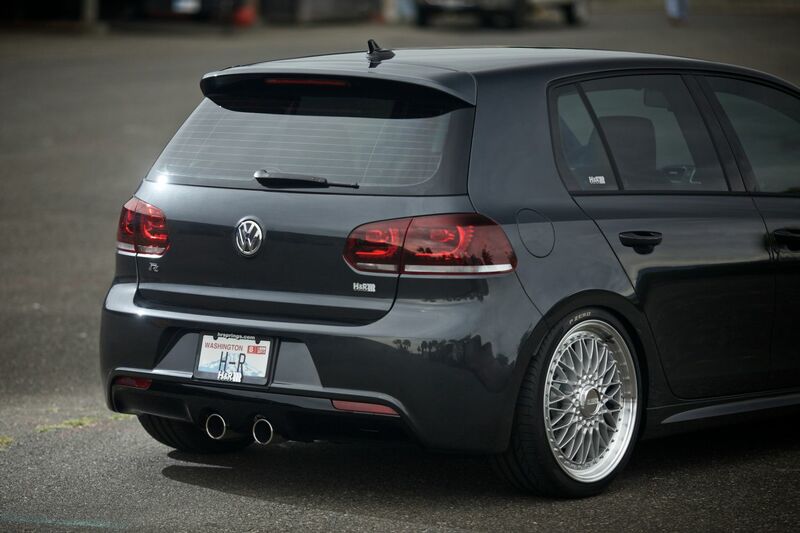 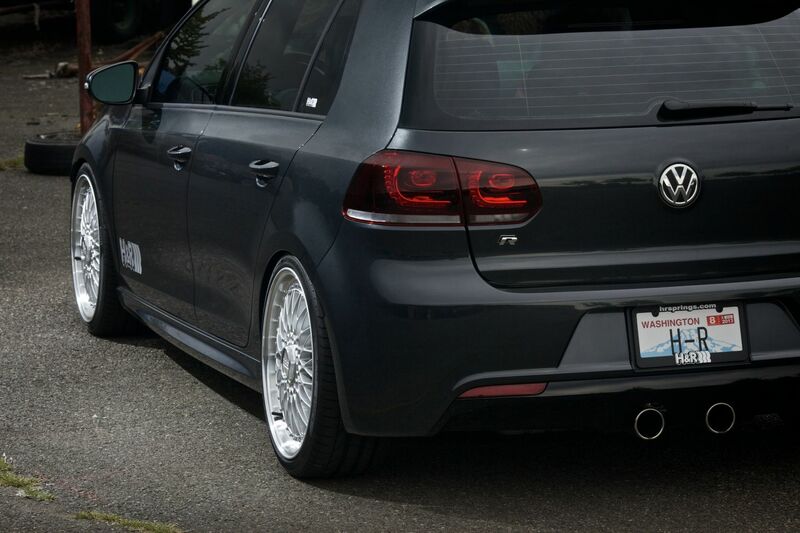 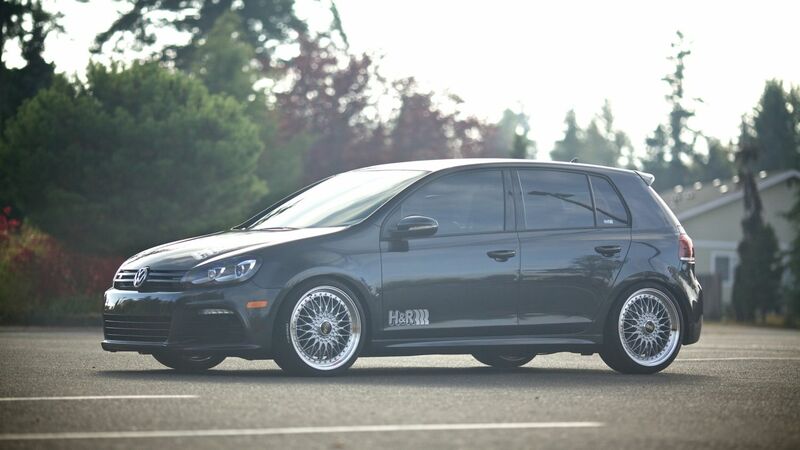 H&R suspension components enhance the look of the Golf R and improves performance equaling more smiles per mile! 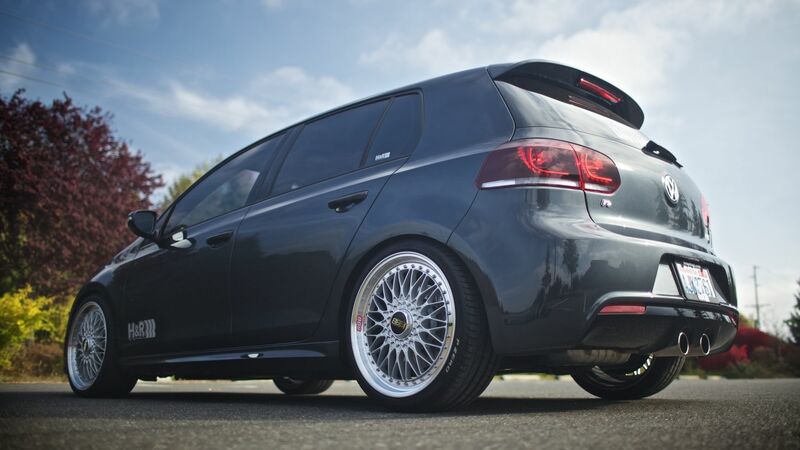 The classic BBS Super RS wheels are extremely popular with Volkswagen enthusiasts and a natural addition to the Golf R project. 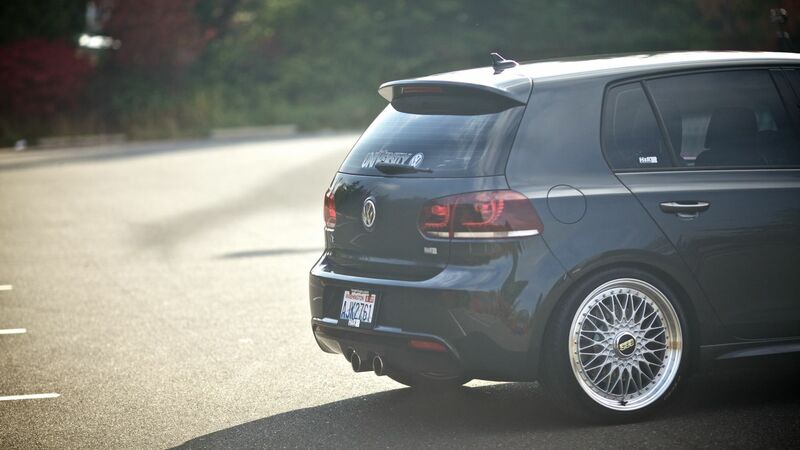 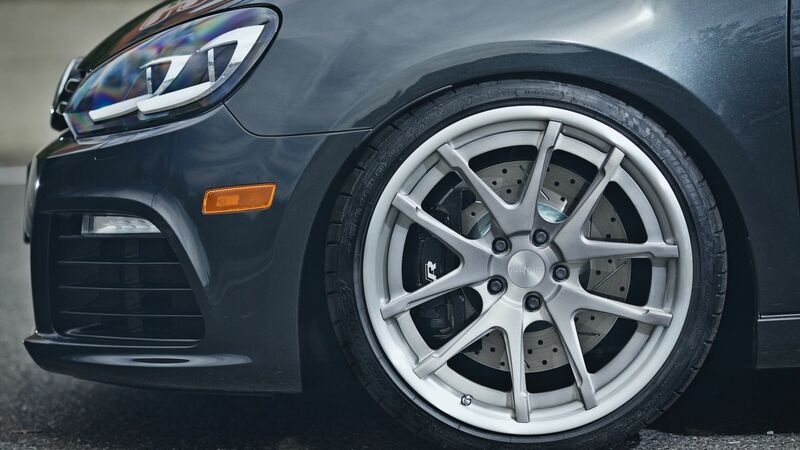 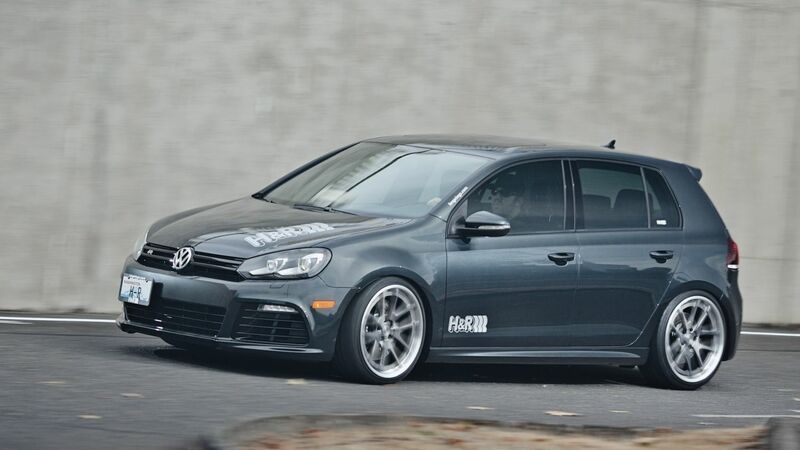 The new Pirelli P Zero Silver tires are mounted on the 19” silver BBS wheels and are a perfect complement to the carbon grey Golf R. The huge Golf R brakes have been augmented with Baer DecelaRotors drilled and slotted, contributing to the car’s all-business appearance, and provides enhanced braking capacity as well as cooler operation. 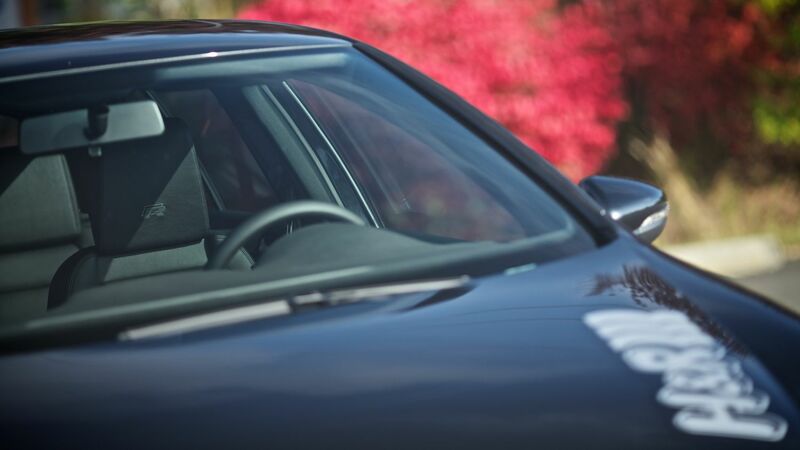 The brand new Phantom series G-Stop brakeline kits are special black poly-coated stainless steel brakelines from Goodridge. 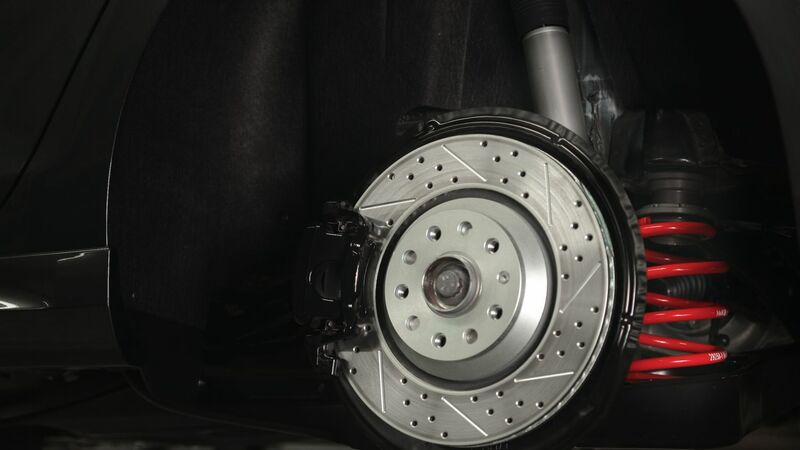 These provide a more responsive and firm brake pedal feel. 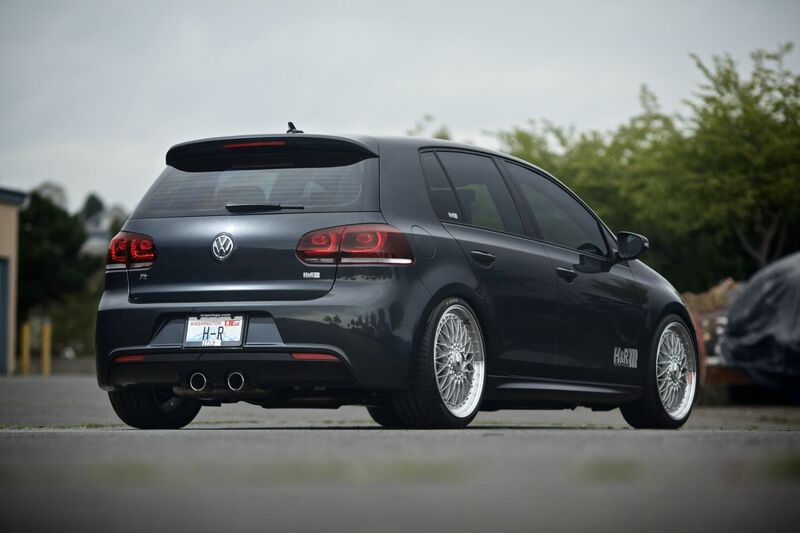 Special European parts from ECS Tuning include original Golf R LED taillights with a rear fog light and factory reverse camera. 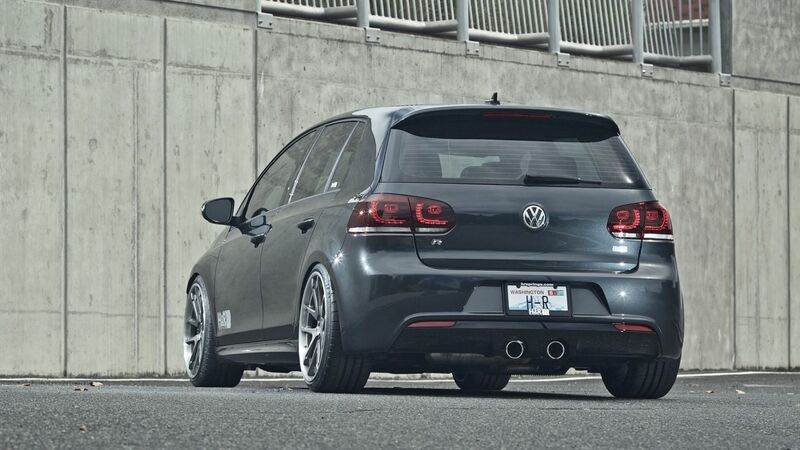 The European LED taillights are a must have addition and the reverse gear activated back up camera is hidden in the rear automatic tilt VW emblem lending to 007 coolness! 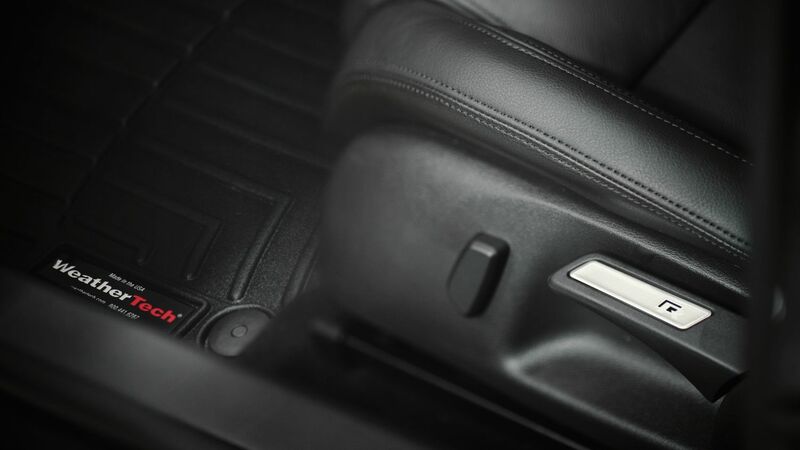 Inside, as always, we feature awesome WeatherTech® FloorLinerDigitalFit® accurately and completely lining the interior carpet giving “absolute interior protection!” Digital laser measurements of interior surfaces offer a consistently perfect fit. 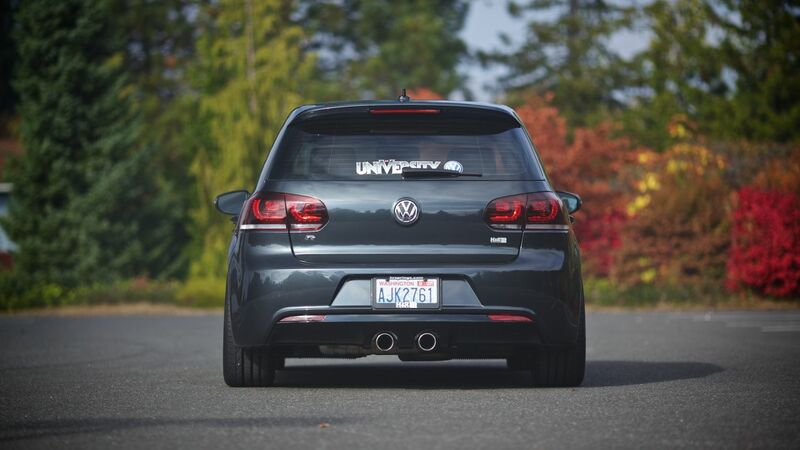 A patent pending High-Density Tri-Extruded (HDTE) material allows for a rigid core for strength while offering surface friction to the carpet, as well as tactile feel to the surface. 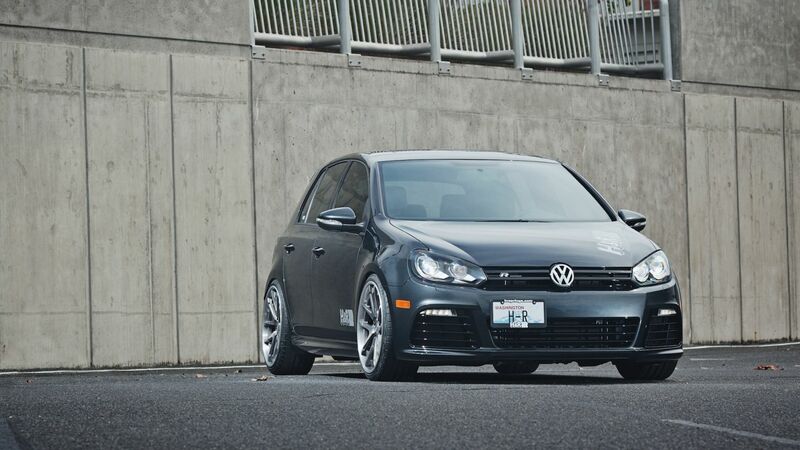 They always look great and keep the Golf R interior carpet looking brand new. 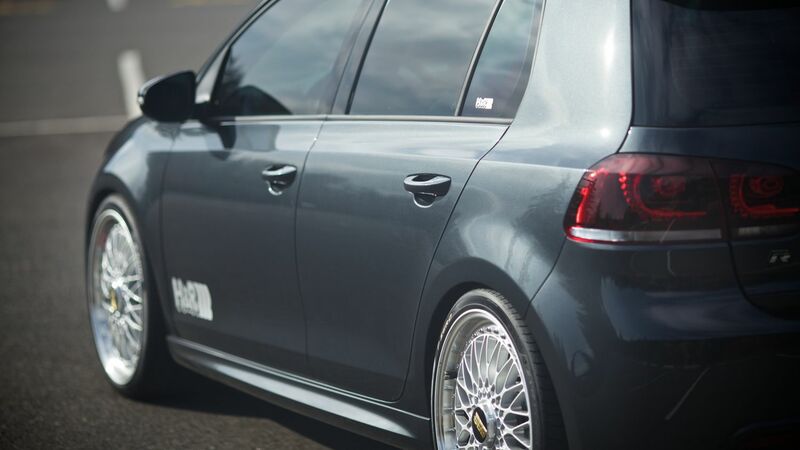 The factory head unit has been upgraded to RNS 510 multimedia system featuring HD video with Travel Link, Live Traffic, a hard drive, and can play DVD movies. 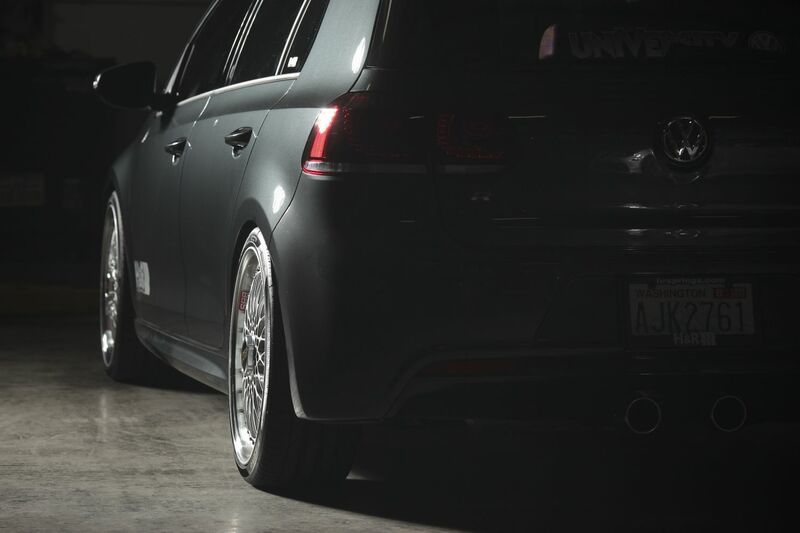 Additional “R” aluminum accents and LED lighting round off interior details.